This page is preliminary. For a more comprehensive presentation of our results, we refer to our paper, which you can request by contacting us directly. 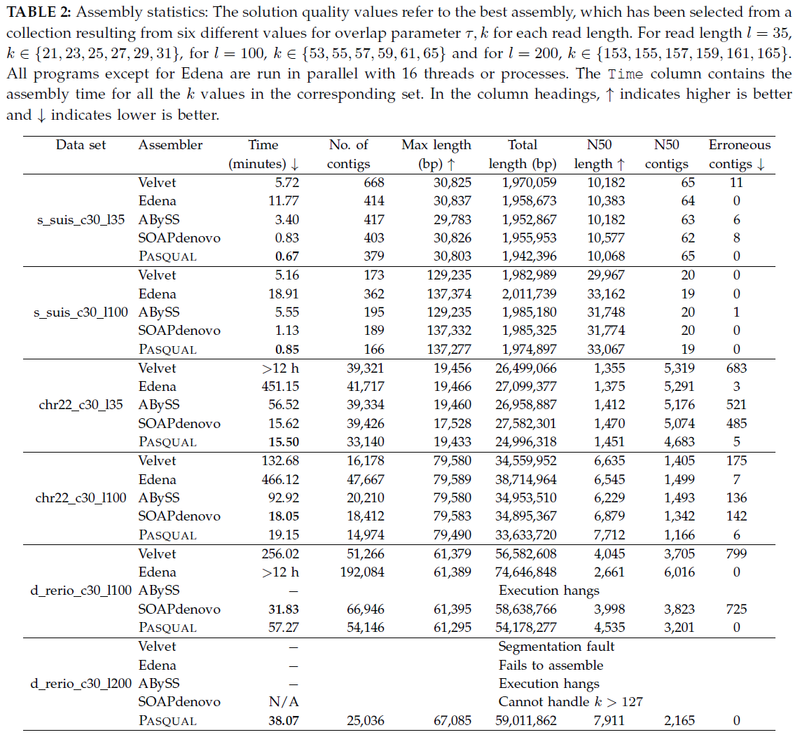 Below you can see the main assembly statistics we compiled in our experiments for the paper. PASQUAL is compared with Velvet, Edena, ABySS, and SOAPdenovo. The parameters used for the various tools can be found here. The speedup achieved by PASQUAL on a dual-processor server with Intel Xeon X5570 is shown below. Note that we use the values for two threads as reference to account for the architecture, which has two sockets, eight cores and up to 16 threads using hyperthreading. 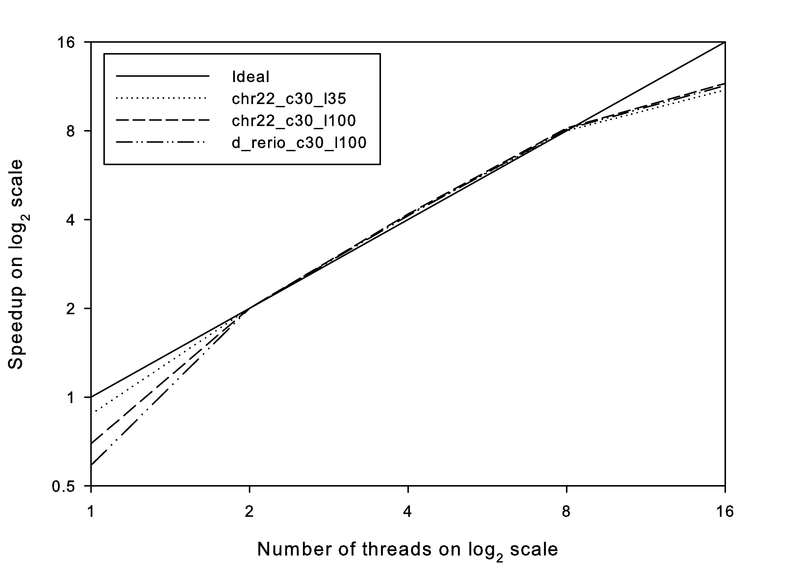 The values are superlinear when compared to one thread. This is mainly due to the use of a two socket system, where using only one thread yields a lower memory bandwidth. When normalized by the values obtained with two threads, the speedups are close to linear (sometimes slightly superlinear due to cache effects) until eight threads, the number of physical cores. Even when using hyperthreading, we obtain good scalability with 16 threads, as PASQUAL is 5-6 times faster than with two. The next figure compares the scabality of PASQUAL and SOAPdenovo. SOAPdenovo is the only tool we found that delivers an assembly speed comparable to PASQUAL's. The data were obtained on a server with Intel Xeon E7-8870 processors (40 cores in total) using up to 80 threads. 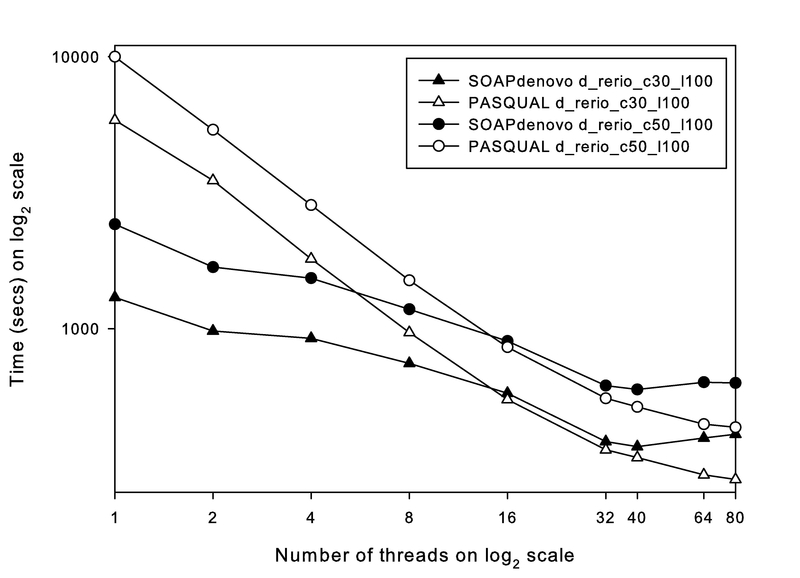 PASQUAL is slower than SOAPdenovo with up to 16 threads, where the two have very similar performance. But PASQUAL scales much better than SOAPdenovo and thus has a better performance on more cores. To summarize this non-exhaustive presentation: PASQUAL is capable of handling data with billions of bases. Unlike SOAPdenovo, the only close competitor we are aware of in terms of performance, PASQUAL is not restricted to k-mer (or overlap) lengths smaller than 128 and PASQUAL produces signiﬁcantly fewer assembly errors.